Most American Jews can rattle off a list of Hanukkah traditions such as lighting the menorah each night; playing dreidel games; eating foods cooked in oil; and giving gifts. However, many wonder if this last tradition is really a Jewish tradition, or whether Hanukkah presents just came about in reaction to Christmas. Looking for Hanukkah gift ideas? 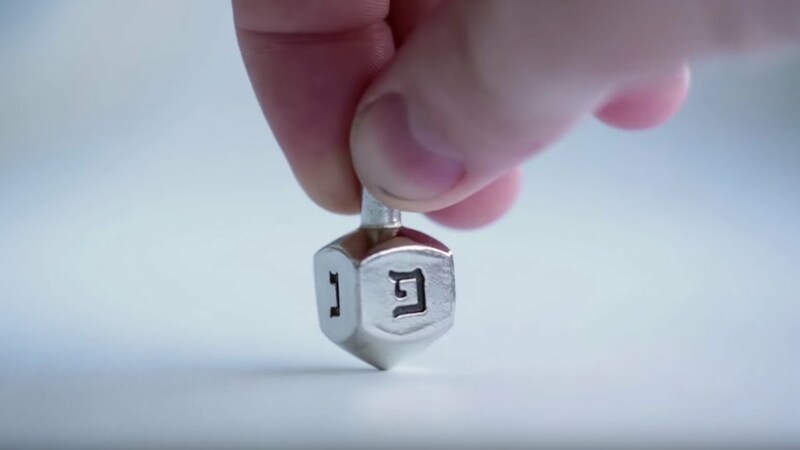 Check out our roundup of Hanukkah gift guides! When Did Jews Start Exchanging Hanukkah Gifts? Jonathan Sarna, professor of American Jewish history at Brandeis University, explains that American Jews used to exchange gifts only on Purim, but in the late 19th century there was a shift from Purim to Hanukkah. Christmas itself became magnified in the late 19th century when it became a national holiday in America. The Jewish custom shifted in imitation of Christmas, as the Christian holiday’s consumerism grew. The precise origin of Hanukkah gelt is unclear. The most popular explanation is that coins became a symbol of the holiday because the ancient Jews’ ability to make their own coins was a symbol of the independence they gained in the battles that the festival of lights commemorates. In his book Holidays, History and Halakhah, Eliezer Segal argues that the earliest sources that mention gelt on Hanukkah are about students in Europe giving gelt to their teachers. Segal suggests that this practice was perhaps inspired by semantic and etymological connections between the Hebrew word Hanukkah (dedication) and the Hebrew word hinnukh (education). According to Segal, some Jewish communities used the Hanukkah season to recognize religious teachers who, because of the prohibition of accepting money for teaching Torah, would normally not accept payment for their work. Segal suggests that students whose parents gave them money to pass on to their teachers eventually started to ask for their own share of gelt. This might be the source of the custom to give gelt to children on Hanukkah. Today, some families prefer to give Hanukkah money rather than gifts because they view gelt as a more authentically Jewish tradition. Minka Goldstein, a mother of six, says she gives one dollar per candle, not counting the shamash (the “helper” candle used to light the other ones). On the first night her kids receive one dollar; second night, two, etc. The total is $36 for eight nights, and she says her children (and now grandchildren too) love it. Goldstein uses this as an opportunity to teach her kids how to spend wisely. When they were little, she took her kids to Toys R Us and let them decide what to buy with their $36. Dianne C. Ashton, Director of American Studies at Rowan University and author of Hanukkah in America: A History, explains that the trend of exchanging Hanukkah gifts really took off in the 1950s. At this time, Jewish child psychologists as well as rabbis started promoting gifts as a way to make post-Holocaust Jewish kids happy to be Jewish, rather than sad about missing out on Christmas. Christmas envy remains a concern for many Jewish parents today. Janet Zuckerman, a mother of three, says it is particularly hard for her kids this time of year because their cousins celebrate both Hanukkah and Christmas and receive presents for both. Like Zuckerman, most parents do give some gifts for Hanukkah. Though gifts might make Hanukkah seem like a “Jewish Christmas,” there can be value in taking time to select a thoughtful and tasteful gift for a child you love. And there is undeniable pleasure in seeing children excited to play with new toys — especially when those toys are helping them learn and develop new skills. Rabbi Sandy Rubenstein, director of Jewish Chaplaincy Services at the Jewish Social Service Agency in Rockville, Maryland, offers some advice for families that want to give gifts, but also want to avoid excessive materialism. She suggests that families can light candles to honor justice or peace, or talk about what brings light into one?s life or what places in this world need more light. Even with gift giving, family holiday celebrations can still aim to foster social consciousness. When Myers’ kids do receive Hanukkah gifts, she has them look through their toys and determine what they no longer play with and can, thus, donate. Also, at winter break of each year, her children decide where to give whatever is in their home tzedakah (charity) box. Your children may be surprised to learn that the custom of gift-giving is largely American. Beatriz Yanovich and her husband came to the United States from Colombia. Her three children grew up in Richmond, Virginia. For more on celebrating Hanukkah with children, visit our partner site Kveller. 7 ways to make the Festival of Lights more meaningful and less materialistic.